Toyota 86 and its close cousin the Subaru BRZ, not to forget the evergreen Mazda MX-5, show there’s still a place for affordable sportscars in Australia. To be honest we would rather spend time in any of them than join the craze for pickup trucks that are clogging our roads at the moment. Which brings up thoughts of owning an older Toyota sports machine that can be bought for as little as $2000 on the used car market. 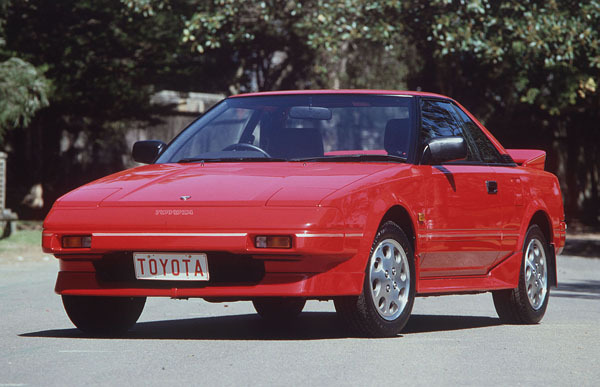 The pure Toyota MR2 – a rear-engined two-seat machine that’s a delight to drive. 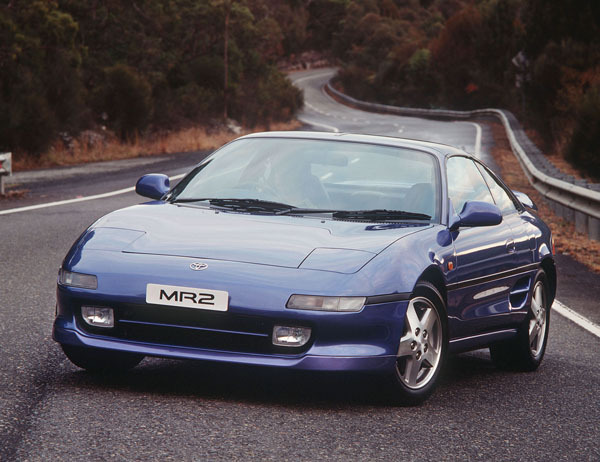 Toyota MR2 is often referred to as the Mister 2, but the name actually stands for Mid-engine Rear-drive 2-seater. If you can’t afford a new Ferrari and are terrified at the thought of having to sell your house if a secondhand Ferrari breaks down – then a used Mr 2 might be just what you need. The MR2 is typically Toyota in the reliability stakes in that it can run for years on end without problems correctly maintained and driver properly. One with a service book always rubber stamped by a Toyota dealer would be high on our short list. The MR2 hasn’t been sold on the new-car market since 2006 but when we shopped around for a used one we came across many that have lots of life left in them. Having said that, make sure to get a professional to do the final pre-purchase inspection. A mid-engined car has the best possible balance on the road and during track days. But in a Toyota MR2, like all of its type, the difference between being in control and sideways and then backwards is relatively narrow. We suggest added driver training, ideally at a track, if you intend to take the car to its limit. At-the-limit handling improved with the second-generation Toyota MR2 of March 1990 and again with a revamp of the suspension in February 1992. If you only want a cruiser and have no intention of driving it hard it may work fine for you. But do you really want a pure sports car that you won’t extend? As it is strictly a two-seater, the Toyota MR2 is relatively spacious in its cabin because there’s not need to compromise on squeezing in another pair of seats. Boot space is better than average for a car of this types the little Toyota is capable of holding a week’s shopping, or even holiday luggage if you are careful with your packing. Until the third-generation model of 2000 the Toyota MR2 was a closed coupe with a targa top, from then on it was a full convertible. Some of these older sequential manuals aren’t all that good. Give yourself a decent time on your test drive to see what you think. Toyota MR2 is not an easy car to work on because the power unit is hard to reach. Professional mechanics generally remove the complete engine / transaxle and work on it on a bench. Insurance companies tend to be wary of sportscars especially those driven by youngsters, or by people with a poor driving record. Shop around for the best deal but make sure you are comparing them accurately. 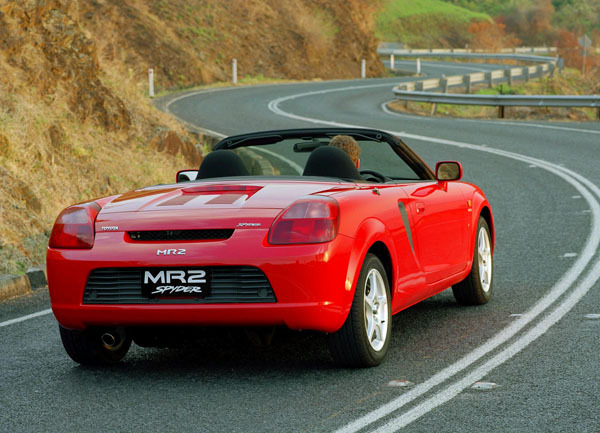 Toyota MR2 quietly disappeared from the Australia market in March 2006. If the engine smokes from the exhaust and/or the oil filler plug it’s probably due for a major overhaul. Smoking is at its worst when the engine is left to idle for a minute or so, then accelerated hard. Have a good look at the interior, including under the carpets, in case an MR2 convertible has been caught out in the rain with its top down. To check for previously repaired crash damage: sight along the length of the panels for a ripply finish indicating they have been panel beaten; look for a mismatch in paint colours between panels; see if there are any small paint spots on unpainted areas such as glass and plastic parts. Signs of competition use in an MR2 are usually easy to spot: look for a roll-cage; extra instruments (though sometimes they are there for show and not go); bigger wheels and tyres; a body kit; sports seats, and so on. Look for heavy brake-dust buildup on the insides of the wheels and on the front suspension components. Uneven tyre wear caused by hard cornering is easy to spot – be suspicious of tyres that have recently been renewed. Finally, check for poorly repaired areas of body in out of sight areas such as in the front ‘bonnet’, the rear boot and the engine compartment. Severe engine wear may make an MR2 slow to start. It’s usually worst when stone cold so try to arrange to get to the engine first thing in the morning. Budget to paying from $2000 to $3500 for a 1988 Toyota MR2; $3500 to $6000 for a 1994 Bathurst; $4000 to $7000 for 1998 GT; $5000 to $8000 for a 1989 Targa; $6000 to $10,000 for a 2005 Spyder; and $7000 to $11,000 for a 1995 Targa or a 2006 Spyder.